I've been moving to a new flat and with everything that it involves I haven't found the time to cook and write a single recipe. All my seasoning and ingredients were packed so I was cooking very basic recipes for four days. 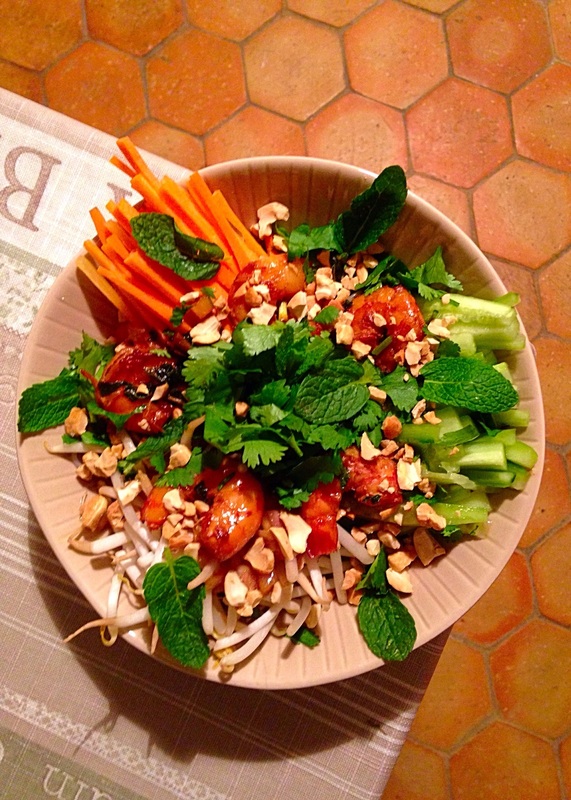 As sunday night arrived, that everything was settle and in order, I was craving a Vietnamese dish called Bobùn. Paris Hanoï is for me the best place in Paris where you can eat this special meal but unfortunately this place was fully booked by the time I got there. But as I found the time between two boxes to quickly go the organic food market down my street, I realized in the way back home from the restaurant that I had everything in my fridge to make one. BoBùn is a Vietnamese traditional dish made up of rice vermicelli called "bun", of a few raw vegetables and of stir-fried beef called "bo". It is mainly a salad, as everything is raw except the meat that is cooked. There are many kinds of bobùn, some are made with nems, some with stir-fried chicken and others with shrimps called "Tom". Therefore it becomes a TomBun, or if you prefer: a Vietnamese shrimps bobùn and this is the one I chose to cook for my sunday dinner. This meal is very easy to prepare as everything is raw except from the shrimps that are cooked for only 4 minutes, which is peanuts! This recipe is very refreshing, full of taste and I'm sure that as soon as you start making your own, you won't go to the restaurant to eat it anymore. Let's prepare the marinade: Remove the shell from the shrimps and put them in a bowl with all the ingredients from the marinade list. Stir gently to combine and put it in the fridge for 20 minutes. Meanwhile, bring water to a boil. Add the rice vermicelli and cook it according to the instruction, it should be around 3 minutes. Do not wait any longer otherwise they will stick to each other. Once ready, drain out the excess hot water on a colander and add fresh water on them to make them cold. set aside once cold enough. Meanwhile, start cutting the vegetables in julienne style. Then prepare the sauce by adding all the ingredients from the seasoning part into a bowl and mix well until everything is combined properly. Dressage: Take a bowl and add the lettuce (make a small nest). Then add the cold rice vermicelli. On one third put the carrot, on another put the cucumber and then the bean sprouts. Drizzle with the seasoning mixture. On a small pan on medium heat, cook the shrimps marinade for 4 minutes. Gently place the shrimps in the bowl and drizzle with the marinade left into the pan. 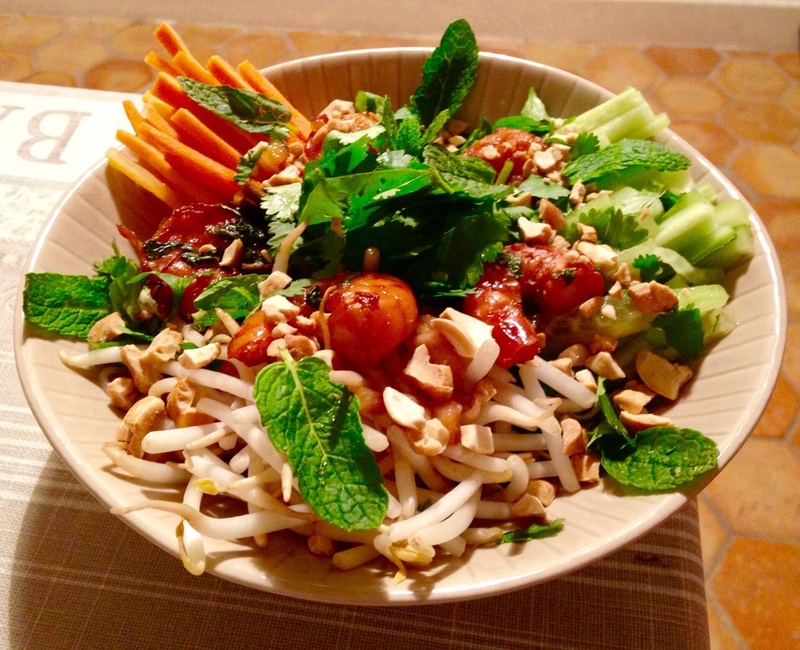 Topped with mint, coriander and grilled chopped peanuts.